What is a sneaker wave? Sneaker waves are sudden, unexpected waves that reach farther onto land than normal waves. They're called sneaker waves because they occur with zero warning. They may surge far onto the beach with deadly force, and are impossible to predict. Sneaker waves also carry large amounts of sand, which can saturate your clothes and weigh you down, making escape from their undertow diffi-cult, if not impossible. There are various ocean conditions which can manufacture sneaker waves. 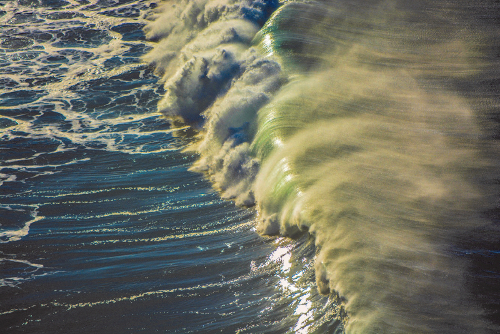 In the Pacific Northwest, we have one of the highest wave-energy levels in the world. This means that our sneaker waves are often produced by offshore storms, which interact with the already high surf. Winter storms can induce sneaker waves that run up the beach 50 yards or more. *Never turn your back on the ocean. *Visually note how far the ocean has previously come by spotting the divide between wet and dry sand, and then stay on the dry sand. *Do not play on logs or large pieces of driftwood.